We’ve been persistently bearish on precious metals since September and that has annoyed our readers. The weak price action, negative divergences and bearish fundamentals are too much to currently overcome for the time being. The gold stocks finally cracked this week and have lost another 7%-8% in only the past seven trading sessions. Silver and Gold denominated in foreign currencies have joined the breakdown. Gold meanwhile has not broken down yet but all indications are that it will soon. 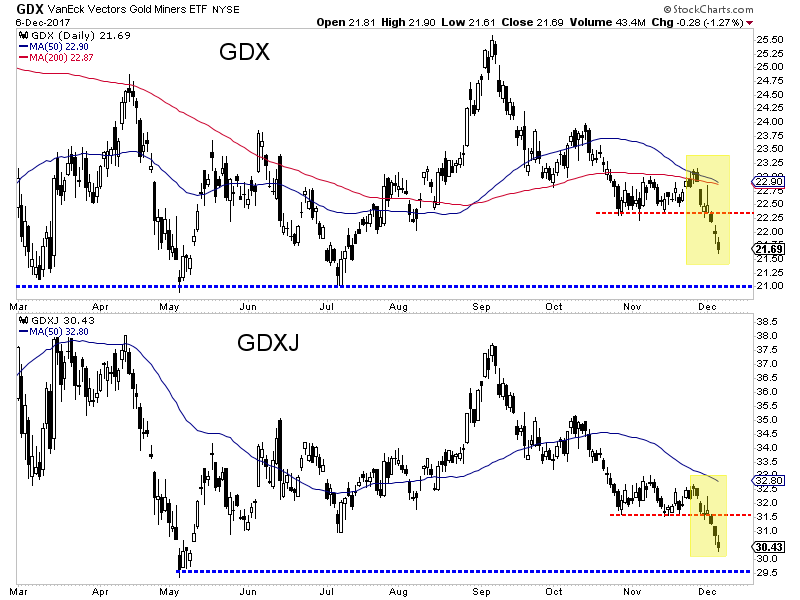 The chart below shows the daily candle charts for GDX and GDXJ which began their breakdown on Monday. They have declined sharply over the past seven trading days and are due for a bounce. 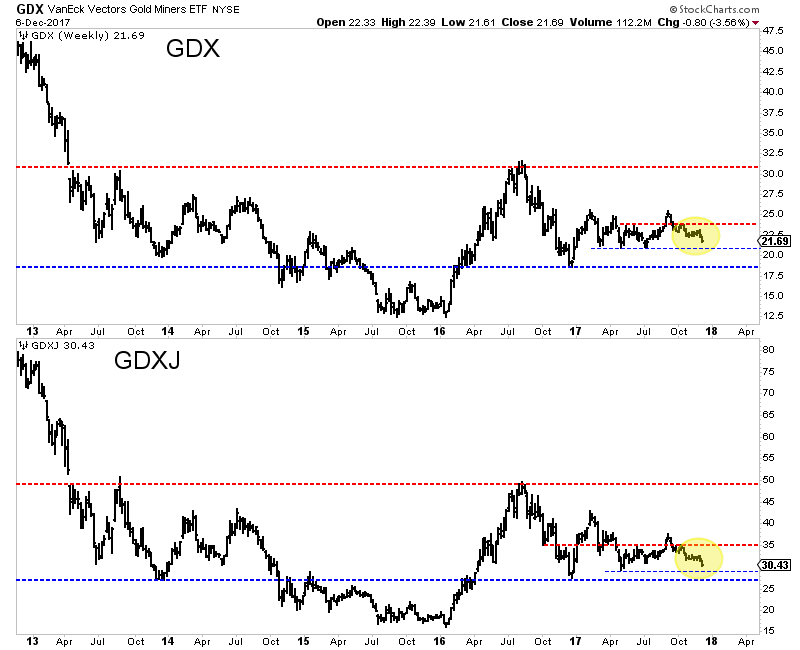 A ~3% decline would take both GDX and GDXJ down to key support at GDX $21.00 and GDXJ $29.50. The miners are getting oversold and a bounce could begin from those levels. Unlike the rest of the sector, Gold has yet to crack as it maintains $1260/oz. As we can see below, Gold/FC lost support and traded down to a 4-month low. This, after Gold/FC tested its 200-day moving average seven times. Gold has held above a confluence of major support that includes lateral support and the 200-day and 400-day moving averages. All indications are that Gold will break below $1260 and if it does, look for support at $1205-$1220. The 30,000 foot, bird’s eye view for miners remains encouraging but they need first to get through the next several months. Initial support levels (for GDX and GDXJ) are $21.00 and $29.50 while future support levels (perhaps in Q1 2018) are around the December 2016 lows. Generally speaking, I’d much rather be a buyer around those levels and not current levels. As we publish this article, Gold has broken below $1260/oz and the gold stocks have moved quite close to the initial support levels. I would not be surprised to see the gold stocks and Silver begin to bounce as Gold moves closer to strong support at $1220/oz. 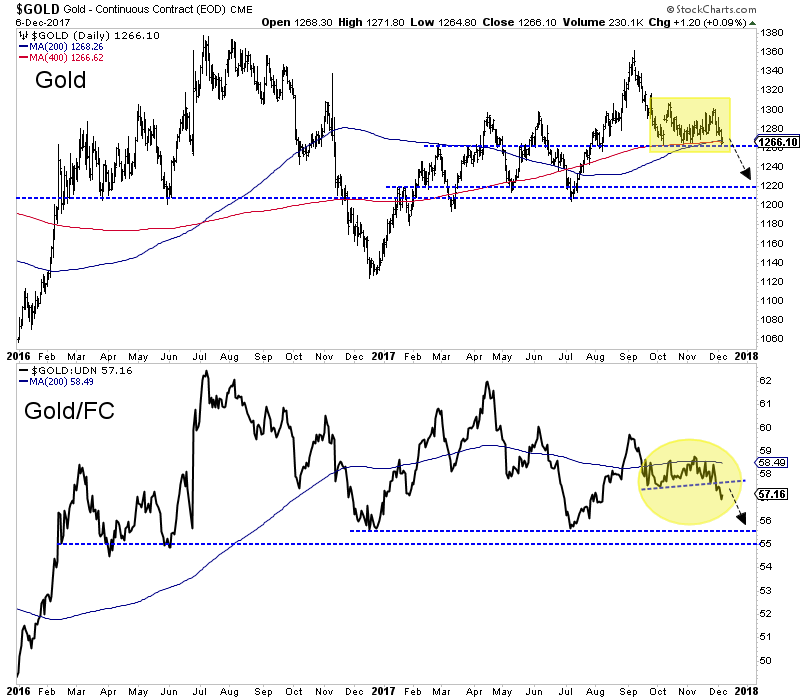 That being said, we are not expecting to turn bullish on the sector as a whole until sentiment worsens and the gold stocks approach strong support at their December 2016 lows. Values are starting to emerge in the juniors but it may be too early to be bullish. In the meantime, the key for traders and investors is to find the oversold companies with strong fundamentals with value and catalysts that will drive buying. To follow our guidance and learn our favorite juniors for 2018, consider learning more about our premium service.